Providing you the best range of silica casted immersion heater, water immersion heater, over the side immersion heater, flanged immersion heater, industrial immersion heaters and clean water immersion heaters with effective & timely delivery. 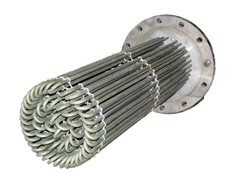 Our company is highly esteemed firm known for offering Silica Casted Immersion Heater to the clients. Silica Cased Immersion Heater is available in various sheathing depending upon the nature of the solution involved. Silica Cased immersion heaters are best suited where contamination of the liquid due to metal Sheath Material is a major problem. The pure fused silica sheath is highly resistant to corrosion, thereby eliminating the possibility of upsetting the chemical balance of solutions by metallic contamination. Water Immersion Heater offered is well recognized in the industry for providing dependable usage support as well as consistent performance. 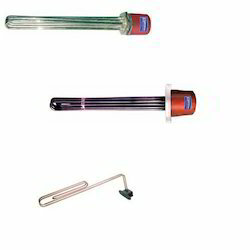 Finding use in different industry sectors, these heaters come designed for direct contact heating of viscous materials, solvents, water, oils and other materials. Further, these can also be used for many industrial heat applications. Some of its features include 100% energy efficiency, different temperature control options, allows tighter process temperature controlling, multiple design options, usage suitability for heating different liquids, suitability for use in high pressure and hazardous areas and choice of customization. Over the Side Immersion Heater offered feature precision designing standards and finds use in installing on tank tops with heated portion of immersion heaters being directly immersed. These immersion heaters also allow for easy removal as well as at the same time provide for suitable space inside tanks. Some of its features include available in different metal based heating elements like of copper, steel, Incoloy, titanium, different selection of kW ratings, mounting bracket support for easy installation, low profile side mounted design finish and suitability to be used with salts, acids, Water, oils, solvents, plating baths and others. Our company has created niche in the field of offering Flanged Immersion Heater to the clients. This product is used in various industrial applications for the purpose of heating different liquids directly by installation of the offered heater within the tanks or containers. Flanged Immersion Heater is made up from tested quality parameters. These products are largely utilized in numerous sectors. Offered range is highly admired for its quality, performance and long life by the esteemed customers. Matrusree electro heats manufactures standard and custom Industrial Immersion Heaters in either a flanged, screw plug or custom flanged design. It consists of a single or multiple heating elements and can be used for a variety of fluid heating applications. However it is important to note that allowable watt density depends on the material being heated. The heating Element are hair pin bent and are either brazed or welded to the mounting attachment depending upon the element sheath material. 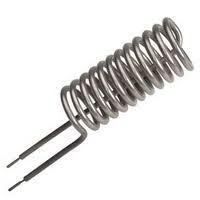 Heating element in Copper, SS304, SS316, SS316L, Incoloy, Titanium, Lead /Teflon Coated Sheath Materials. 1"-3" Brass flange & Custom Flanges. General purpose, explosion and moisture resistant terminal enclosures. High, medium and low watt densities for various processes. Several wattage and voltage combinations are available. Incoloy Sheath: Ammonium Acetate, Caustic Soda, Citric Juices Other corrosive solutions & steam super heating. Copper Sheath: Acetaldehyde, Sulphate Solutions, Cooling Towers, hot water storage, boiler, heating of solutions not corrosive to copper. Mild steel: Asphalt, wax, paraffin, tar, fluid heat transfer medium, petroleum, degreasing and solvent oils, machine oil, fuel oils, alcohol. We are known to manufacture and supply the Clean Water Immersion Heaters. Designed and manufactured as per the requirements of the customers by our experts, these heaters have gained huge appreciation of our leading clients due to their rigid construction and high efficiency. A series of quality tests is conducted on offered products by skilled professionals at every phase of processing. 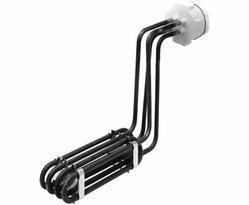 Kettle Immersion Heater offered feature quality construction standards which make these provide for durable and safe usage value in boiling water for tea preparation. Available in different tube diameters and configuration options, these heaters can be offered in different voltage combinations. Some of its features include easy installing design finish, providing for optimum internal electrical insulation and heat conduction support, featuring presence of electrically isolated sheath and others. We can also customize its working parameters as per the specifications provided by the customers. 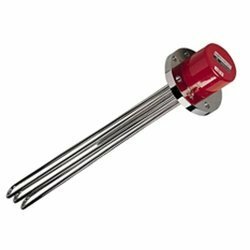 Alkaline Immersion Heater offered comprise heavy duty tube-shaped joule heating element and can be made available in specific watt density as per the particular application demands. 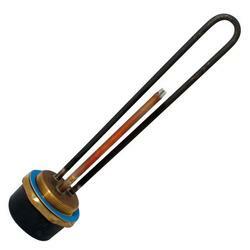 Alkaline Immersion Heater is perfect for Alkaline Solution to 90 degree and finds its application in chemical tank. Durability, sturdy construction and long life performance are the well acknowledges features of these heaters. In addition, our range can be availed at market leading rates. These heaters are suitable for meeting the heating demands of oil, air and others and can be made available in tube diameters of Φ 4 mm to Φ 30 mm. Looking for Immersion Heaters ?